I was pretty happy when I bought my Microsoft Surface, but that’s because I understood what I was getting. But when I start hearing rumors about this new generation of two-in-ones that ran full-blown Windows on Intel hardware… I had to get my hands on one. 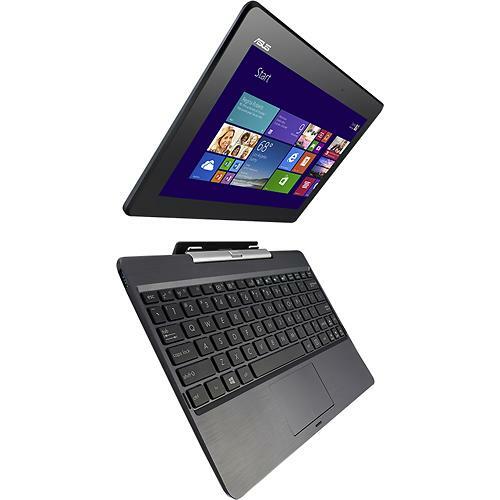 Enter the ASUS Transformer Book T100 . UPDATE: I wanted to put this near the top because I thought they were important things to mention. First, further down in the review, I mention a lot of problems with the touch-pad mouse on the keyboard portion of the device. I realized, later, that I had caused my own problems! I had been uninstalling “bloatware” when I got the computer – there is software called ASUS Smart Gestures. Leaving this on the machine will allow two-fingered scrolling on the touchpad when the keyboard is docked! Secondly, a firmware update has been released for the device which resolves several issues I had been having with the power button. I didn’t mention them in the review because it was early on and I figured it was user error, but it turns out that I wasn’t alone. A BIOS Firmware update has been released to resolve this problem! If you go to the ASUS Downloads page and look for the BIOS update, currently the 10/24/2013 BIOS is the only one listed for a stand alone download. However, if you download and install ASUS Live Update from the same downloads page, it will detect and give you the option to install a BIOS from 12/2/2013. The software calls it BIOS 220. ASUS Live Update can be snagged from the T100 download page, and the firmware update is very easy to apply using the software. The firmware update also seems to extend the battery life of the unit! I picked up the T100TA-B1-GR. B1’s include a 32GB SSD, there is a C1 model with a 64GB SSD hard drive. Model B1 retails at around $349, and the C1 for $389-399. Some sellers are gouging right now, due to limited availability, but the market will correct itself soon, I’m sure. It was nearly by accident that I ordered the 32GB model, but it isn’t the end of the world, having a smaller drive when you have SkyDrive so tightly integrated into the OS. SkyDrive, much like Windows Live Mesh before it and the current SkyDrive for Windows (not the App out of the app store) will actually Sync files down to the computer, so be careful. If you have a 25GB SkyDrive and only 32GB on your SSD, you could find yourself in trouble, but yo ucan easily adapt your sync settings as needed. But these problems aren’t specific to the ASUS Transformer T100, so what else can we say about it? The tablet portion feels solid. Not too heavy, considering the size of the 10.1 inch screen. I find it slightly easier to hold than the original Surface. The edges are more rounded and a little easier on your hands. It feels about the same weight as the 3rd Gen iPad I have been using. The touch screen is responsive, and the resolution is nice, though not as great as it could be. At 1368×768 it seems a bit non-standard, but by cramming the pixels in and the use of Microsoft’s sub-pixel rendering, it becomes a very attractive screen. It includes a front-facing camera for video chat, no rear facing camera for those awkward iPad Photographer moments. The camera takes stills and video at 1280×720. The power button resides on the top of the tablet, while two other hardware buttons sit on the left side. One is a volume rocker which is extremely convenient considering the otherwise painful process of adjusting the volume via the charms bar. The other button disappoints me to no end. It is the hardware Start Button. The original Surface had one capacitive touch button on the bottom edge of the screen, where the Windows Logo was painted. Like many Windows Phone devices, this was what you tapped to bring up the start menu. The ASUS Transformer T100 includes the same Windows Logo, painted the same white, in the same location. Tapping it several times last night yielded no result. That’s when I discovered the other button on the side. Although it is actually more practical and more convenient to have the button somewhere you hands will be most of the time, it was is a bit of a disappointment to know that the capacitive Start Button is not a standard, and will only add to the complexity of Windows on multiple platforms. The tablet includes a MicroHDMI out port, a MicroUSB port which it uses for charging (a very strange feeling, charging “my new laptop” with the same sort of device I use to charge my cell phone – I was impressed it could provide enough power! ), and a slot for a MicroSD card. The MicroUSB charging cable supplied with the unit is a very short three foot cable – if you’re going to charge on the go, and use the T100 while it charges, you’re going to want to find a longer cable. It also does charge slowly when under a heavy load, so don’t be afraid to put it to sleep or even shut it down when charging overnight. The MicroSD card slot is on the right side, and does stick out a little bit when a card is in there. This might be a nuisance if you had planned on leaving the card in as a permanent memory expansion, as I could see somebody pressing their palm on the side of the tablet and accidentally ejecting the MicroSD card. Not a huge negative, but something to be aware of. The keyboard-dock also includes one USB3.0 port. You didn’t think I forgot about the keyboard, did you? The attachment that makes this device more than a tablet, more than a Surface RT with a Touch Cover… the keyboard attachment. First of all, it has heft. It does add some weight, which is surprising because the battery is entirely in the tablet portion. Some people see this as a negative, however I actually like that it acts as a counterweight to the “screen” and allows for your standard laptop or netbook use-cases (such as on the lap, or on the arm of a chair). I absolutely love the hinge that the tablet docks in to. You have to press firmly, and Windows will chime when it detects the new hardware of the mouse, keyboard, and USB port. But having the ability to set the screen at any angle, and even close it and carry it just like a regular laptop? This is a big convenience, after dealing with the kickstand on the Surface RT for the last year. The wrist-rest portion has a “brushed metal” appearance, although clearly being made of plastic. Other reviews have complained of the cheap build quality, one reviewer even said they would be going back to their MacBook Air. It’s asinine to compare a $1,000-1,500 MacBook Air to a $350-400 ASUS device. Any rational person is going to expect less from the $400 device, but in my opinion, it was by no means a disappointment. It is plastic, but it’s not going to fall apart in a few seconds. The “Chiclet” keys are responsive and feel like they are the right distance apart, but some people may be disappointed that they are not backlit. It is no more crowded than any other 10 inch or below netbook I have used (and I had the 8.9 inch ASUS Eee PC 900HA). The biggest letdown on the entire device, top to bottom, has got to be the touchpad on the keyboard attachment. It is not sensitive enough, I find myself having to firmly press my finger down simply to move the cursor around the screen. The unified “pad/mouse buttons” mean there is no physical divide between left and right click, it’s all about finger placement – there is a line painted, but the whole touchpad seems to move when clicking. Multi-Touch is painfully lacking, so two fingered scrolling is right out the window. Having the ability to scroll using the mousepad is an essential feature when using Windows 8.1’s Start Screen. My Samsung laptop and my Surface both had this feature, it’s sad to see a “second generation” Windows 8 device lacking this feature. Luckily, the touch screen is not disabled when docked, so you can reach up to tap and swipe as needed. Out of the box it didn’t include much in the way of “Bloatware” and I was surprised to find an activation code for Office 2013 Home and Student edition. I didn’t activate this, yet, so I will be interested to see if I misread it and perhaps it is just a trial of Office 365 or something, but still a nice touch when competition like the Surface RT does include a full-featured Office 2013 Home and Student installation. Update 2: now available in new colors, and at a new lower price (get the 64GB model for the price I paid for the 32GB!)! For the $350 I spent on the B1 model, I can’t find a thing to complain about beyond the touchpad. Hook in a USB mouse, or just rely on the touch screen, and forget that is there. Otherwise it’s a great device, and people complaining about build quality need to think about other sub-$500 purchases they’ve made before they whine and complain about plastic. Last but not least, a note on performance. Again, you’re not buying this to be your new Steam-running gaming computer. At $350, I am not expecting much. But the 3D Acceleration within Windows was surprisingly not a huge disappointment. It’s more than capable of playing the kinds of games you can currently download from the Windows 8 Store, including one of the most graphically demanding games, Hydro Thunder. It looked good, and more impressively, sounded good. The speakers are on the back of the tablet portion of the device but are also piped through the sides, so when holding the tablet your own hands are cupped to direct the sound back at you. Although slightly tinny, as is to be expected from small speakers, the quality is impressive and the tablet can get extremely loud. For a 1.33Ghz CPU and 2GB of RAM, I’m highly impressed with what this little thing can do for me, and I’m looking forward to using my new ASUS Transformer T100 for quite a while.